FILE - Sen. Rand Paul (R-Ky.) departs the weekly Republican policy luncheon on Sept. 25, 2018, in Washington, D.C.
Boucher's attorney, Matt Baker, said they would appeal. 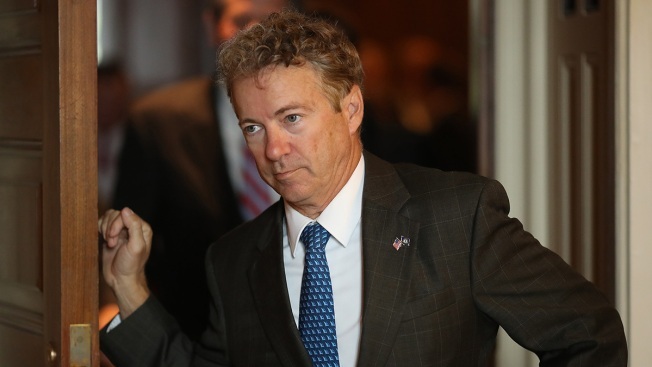 "We all expected that Sen. Paul would get a verdict in his favor," Baker said. "This far exceeds anything that we were expecting." The trial included testimony from doctors as well as other who live in the neighborhood, but the most riveting testimony came from the longtime neighbors — Paul and Boucher. Paul, a former GOP presidential hopeful, told the jury Monday that immediately after the attack, "the thought crossed my mind that I may never get up from this lawn again." An apologetic Boucher acknowledged he wasn't thinking rationally and called it "two minutes of my life I wish I could take back." Paul showed no outward emotion, sitting between his lawyer and his wife in the courtroom, as Boucher recounted the attack. In his lawsuit, Paul sought up to $500,000 in compensatory damages and up to $1 million in punitive damages. Baker conceded during the trial that a "reasonable award" might be in order for Paul's pain and suffering but said no punitive damages should be awarded. Baker said that Paul had resumed his "customary lifestyle" that includes golf and a skiing excursion. After the verdict, Baker said "multiple issues" will come up during their appeal. Asked if Boucher has the financial resources to pay the damages, the attorney replied: "We're going to talk about that." Paul testified that he got off his riding mower to pick up a stick and was straightening up when Boucher hit him from behind with such force that both flew through the air 5 or 10 feet (1.5 to 3 meters). He said he was wearing noise-canceling headphones and didn't hear Boucher coming toward him. The attack in Paul's yard was motivated by lawn care, not politics. Paul said after the verdict that people can hold different views whether it's on politics, religion or "day to day matters. It's never OK to turn those disagreements into violent, aggressive behavior. I hope that's the message from today."